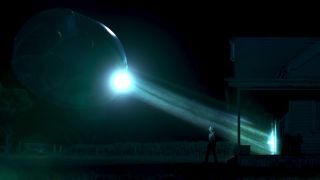 A still from the trailer of "Childhood's End," a six-hour SyFy Channel event based on a novel by famed science fiction author Arthur C. Clarke. It will debut on Dec. 14. The Syfy Channel has unveiled the launch dates for TV adaptations of two epic science fiction books and greenlit the development of two other new TV series based on classic sci-fi novels. Two of the shows, "Childhood's End" (based on the acclaimed Arthur C. Clarke novel) and "The Expanse" (based on a book series by Daniel Abraham and Ty Franck, under the pen name James S. A. Corey), will debut in December. Meanwhile, Syfy is developing two new series based on "Gateway" (an award-winning novel from Frederik Pohl) and "Hyperion" by Dan Simmons. "Childhood's End" is a six-hour miniseries that follows the peaceful invasion of Earth by the alien Overlords, who promise to eliminate poverty, war and sickness – ushering in a golden age of peace, health and security for all of humankind," Syfy wrote in an announcement Wednesday (Aug. 12). "But why do the Overlords insist on hiding their appearance – and what do they ultimately want from Earth?" "The Expanse," will launch at the same time and have 10 episodes in its first season. Its premiere airs Dec. 14 and 15 at 10 p.m. EST, with the remainder of the series airing every Tuesday afterward at 10 p.m. EST. The novel series "The Expanse" is the relative newcomer of Syfy's three upcoming projects. It began with the book "Leviathan Wakes" in 2011 and has been followed by four more entries each year so far, most recently "Nemesis Games" released in June. "The Expanse is set two hundred years in the future, after mankind has colonized the solar system," Syfy wrote in a second announcement. "A hardened detective (Thomas Jane, "Hung") and a rogue ship's captain (Steven Strait, "Magic City") come together for what starts as the case of a missing young woman and evolves into a race across the solar system to expose the greatest conspiracy in human history." Syfy's "The Expanse" will air Tuesdays at 10 p.m. for the weeks following its premiere. On Wednesday, Syfy also announced that it is developing Pohl's 1977 book, "Gateway," which won Hugo and Nebula awards, into a TV series. The script adaptation and executive production will be done by David Eick ("Battlestar Galactica") and Josh Pate ("Falling Skies"). "In Gateway, humanity discovers an asteroid teeming with the long abandoned spaceships of an advanced alien race – the Heechee – setting in motion a gold rush for alien artifacts and technology," Syfy wrote in yet another announcement Wednesday. "The ships are preprogrammed, transporting their voyagers to distant worlds of riches – or certain death." In June, Syfy Channel also announced that it is developing another new series based on the Hugo award-winning novel "Hyperion." "Set on the eve of Armageddon with the entire galaxy at war, 'Hyperion' is the story of seven pilgrims who set forth on a voyage to seek the answers to the unsolved riddles of their lives. Each carries a desperate hope and a terrible secret -- while one may hold the fate of humanity in his hands," Syfy Channel representatives wrote in a June 10 statement. The Oscar-nominated Bradley Cooper ("American Sniper") serves as executive producer for "Hyperion," with Graham King ("The Departed") and Todd Phillips ("The Hangover") as producers. So science fiction fans, take note. With the Syfy Channel getting serious about its book adaptations, your TV dance card is going to get full fast, like warp-speed fast.